The owner of Pearl Clothing in Alotau, Tina, is open about how hard she struggled to reach sustainability. “I call this place my gravel experience,” she says while pointing to an open lot next to a tire repair shop. “I had my shop here. It was out in the open. I would only make K5 or K20 a day. We would spread the second-hand bale bags on the gravel and put the mattress on to sleep. When we experience heavy rains at night and the place was flooding I put my sons on the clothes bales to sleep.” Throughout these difficult times, when she was not able to make regular payments on her loan, she would go to the bank every day. She asked if she could give them some of the money she made and keep a bit for her workers and children. Loyalty and determination paid off when the Women’s Empower Scheme loan officer told her about the Australia Awards Fellowship. She completed the application process. Leaving her business in the hands of her two faithful employees, Joyce Doilegu, a chronic asthmatic and Movin Topio, a deaf and mute security guard she embarked for Australia. Ever diligent, they kept Pearl Clothing running during Tina’s studies. “I learned about customer retention, adding value, financial management and how to do a SWOT analysis,” she recounts of her studies. Taking the lessons from the classroom to implementation, Tina moved into her new premises in August. 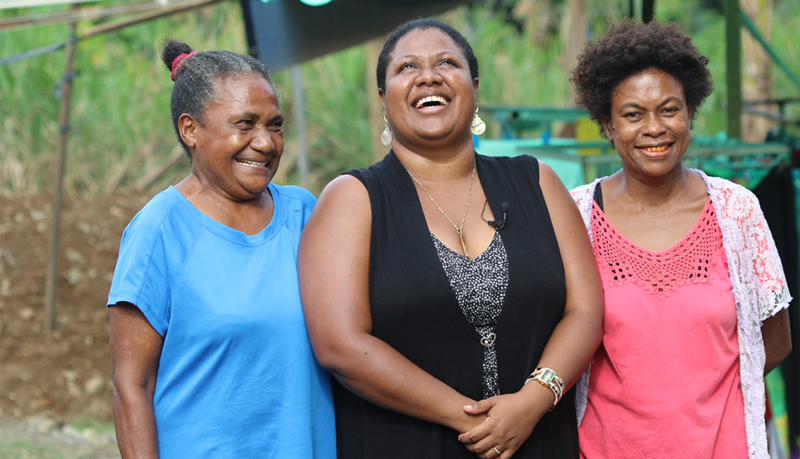 She built the structure from the ground up and even made space on the land for her protégées some of whom are third generation 20 Kina Multiplication Challenge participants.